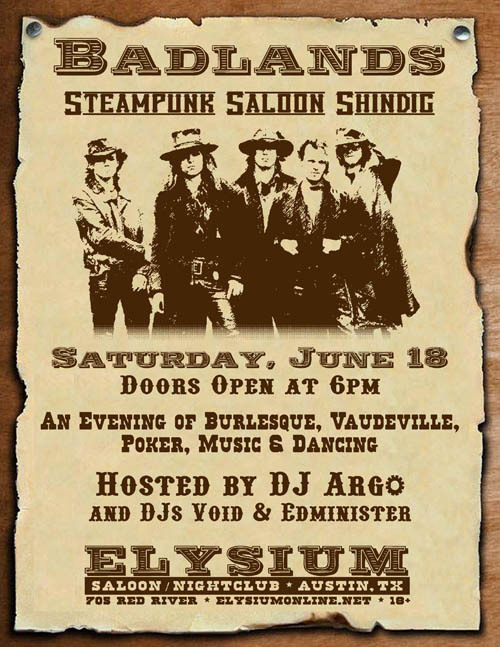 The Elysium Badlands Steampunk Saloon Shindig is June 18th! PLEASE NOTE: Door open at 7pm. This is an age 18+ event. Music, Dancing, Costume Contest and Vendors! Cost is $4 in costume for 21+, and $7 for those under 21 & people not in costume. This is going to be a mighty fine shindig! Brass Apple: Purveyors of awesome Asian-inspired steampunk! Parkers and Quinn: Leather crafters with steamy goggles, accessories, masks and more! Caveat Emptor Costumes: Specializing in Victorian & Edwardian style costume millinery! O.M. Grey: Author of Avalon Revisited, an Amazon.com Gothic Romance bestseller! The Mysterium, Turner's Tokens, O.M. Grey, SteamBath Factory, Parkers and Quinn, The Brass Apple, COGstume and GEARments, Secret Oktober, Caveat Emptor Costumes and more! Wild West Poker starts at 7:30. Seats are limited so sign up quickly. Shoot me an email at steampunkpoker@gmail.com and I will reserve a spot for you.